Toast Ingredients: Polyethylene Terephthalate, Mica, Squalane, Synthetic Fluorphlogopite, Calcium Sodium Borosilicate, Silica, Hydrogenated Styrene/Isoprene Copolymer, Polyurethane-11, Caprylyl Glycol, Talc, Ethylhexylglycerin, Tin Oxide, Aluminum Hydroxide, Glass Beads, Calcium Aluminum Borosilicate, Tocopherol, Pentaerythrityl Tetra-Di-T-Butyl Hydroxyhydrocinnamate. (+/-) Titanium Dioxide (Ci 77891), Carmine (Ci 75470), Iron Oxide (Ci 77491), Yellow 5 Lake (Ci 19140), Aluminum Powder (Ci 77000). *Contains Carmine As A Color Additive./Contient Du Carmin Comme Additif De Couleur. Sunset Soirée Ingredients: Mica, Talc, Zinc Stearate, Octyldodecyl Stearoyl Stearate, Dimethicone, Synthetic Fluorphlogopite, P-Anisic Acid, Caprylyl Glycol, Ethylhexylglycerin, Aluminum Hydroxide, Tin Oxide, Tocopherol. (+/-) Titanium Dioxide (Ci 77891), Yellow 5 Lake (Ci 19140), Carmine (Ci 75470), Iron Oxide (Ci 77491). *Contains Carmine As A Color Additive./Contient Du Carmin Comme Additif De Couleur. Pink Bubbly Ingredients: Mica, Talc, Dimethicone, Octyldodecyl Stearoyl Stearate, Zinc Stearate, P-Anisic Acid, Caprylyl Glycol, Ethylhexylglycerin, Calcium Aluminum Borosilicate, Tocopherol, Silica, Tin Oxide. (+/-) Titanium Dioxide (Ci 77891), Carmine (Ci 75470), Iron Oxide (Ci 77491). *Contains Carmine As A Color Additive./Contient Du Carmin Comme Additif De Couleur. Velvet Rope Ingredients: Ingredients/IngrÉDients: Polyethylene Terephthalate, Mica, Squalane, Calcium Aluminum Borosilicate, Calcium Sodium Borosilicate, Silica, Hydrogenated Styrene/Isoprene Copolymer, Polyurethane-11, Caprylyl Glycol, Ethylhexylglycerin, Tin Oxide, Glass Beads, Talc, Tocopherol, Pentaerythrityl Tetra-Di-T-Butyl Hydroxyhydrocinnamate. (+/-) Titanium Dioxide (Ci 77891), Iron Oxide (Ci 77491), Aluminum Powder (Ci 77000). Cash Out Ingredients: Polyethylene Terephthalate, Calcium Sodium Borosilicate, Mica, Squalane, Hydrogenated Styrene/Isoprene Copolymer, Polyurethane-11, Caprylyl Glycol, Ethylhexylglycerin, Silica, Tin Oxide, Glass Beads, Talc, Calcium Aluminum Borosilicate, Tocopherol, Pentaerythrityl Tetra-Di-T-Butyl Hydroxyhydrocinnamate. (+/-) Titanium Dioxide (Ci 77891), Iron Oxides (Ci 77491, Ci 77499), Aluminum Powder (Ci 77000), Chromium Oxide Greens (Ci 77288), Ferric Ferrocyanide (Ci 77510). Bellini Ingredients: Talc, Mica, Dimethicone, Calcium Aluminum Borosilicate, Octyldodecyl Stearoyl Stearate, Zinc Stearate, Silica, P-Anisic Acid, Caprylyl Glycol, Ethylhexylglycerin, Tin Oxide, Tocopherol. (+/-) Titanium Dioxide (Ci 77891), Carmine (Ci 75470), Iron Oxide (Ci 77491). *Contains Carmine As A Color Additive./Contient Du Carmin Comme Additif De Couleur. Bright Lights Ingredients: Polyethylene Terephthalate, Mica, Squalane, Calcium Aluminum Borosilicate, Talc, Hydrogenated Styrene/Isoprene Copolymer, Polyurethane-11, Aluminum Hydroxide, Caprylyl Glycol, Ethylhexylglycerin, Tin Oxide, Calcium Sodium Borosilicate, Glass Beads, Synthetic Fluorphlogopite, Tocopherol, Silica, Pentaerythrityl Tetra-Di-T-Butyl Hydroxyhydrocinnamate. (+/-) Titanium Dioxide (Ci 77891), Carmine (Ci 75470), Iron Oxide (Ci 77491), Yellow 5 Lake (Ci 19140), Aluminum Powder (Ci 77000), Ferric Ferrocyanide (Ci 77510). *Contains Carmine As A Color Additive./Contient Du Carmin Comme Additif De Couleur. Last Round, All Nighter, Anything Goes, & Tomorrow’s Tale Ingredients: Talc, Zea Mays (Corn) Starch, Hdi/Trimethylol Hexyllactone Crosspolymer, Dimethicone, Silica, Ethylene/Acrylic Acid Copolymer, Octyldodecyl Stearoyl Stearate, P-Anisic Acid, Zinc Stearate, Caprylyl Glycol, Ethylhexylglycerin, Poloxamer 338, Tocopherol. (+/-) Titanium Dioxide (Ci 77891), Ultramarines (Ci 77007), Carmine (Ci 75470), Iron Oxides (Ci 77491, Ci 77492, Ci 77499). *Contains Carmine As A Color Additive./Contient Du Carmin Comme Additif De Couleur. After Party Ingredients: Polyethylene Terephthalate, Mica, Calcium Sodium Borosilicate, Squalane, Hydrogenated Styrene/Isoprene Copolymer, Polyurethane-11, Caprylyl Glycol, Ethylhexylglycerin,Tin Oxide, Talc, Glass Beads, Calcium Aluminum Borosilicate, Tocopherol, Pentaerythrityl Tetra-Di-T-Butyl Hydroxyhydrocinnamate, Silica. (+/-) Titanium Dioxide (Ci 77891), Iron Oxides (Ci 77491, Ci 77499), Aluminum Powder (Ci 77000). Overall earthy, warmer feel. Neutral, seasonless shades with pops of Vivid & Vibrant Eye Shadow Duo shades Jade, Garnet and Smoky Quartz. The pro-artist curated shades are specially formulated with an artisanal blend of glitter and shimmering pearls that play with light to create shape-shifting, supernatural dimension. 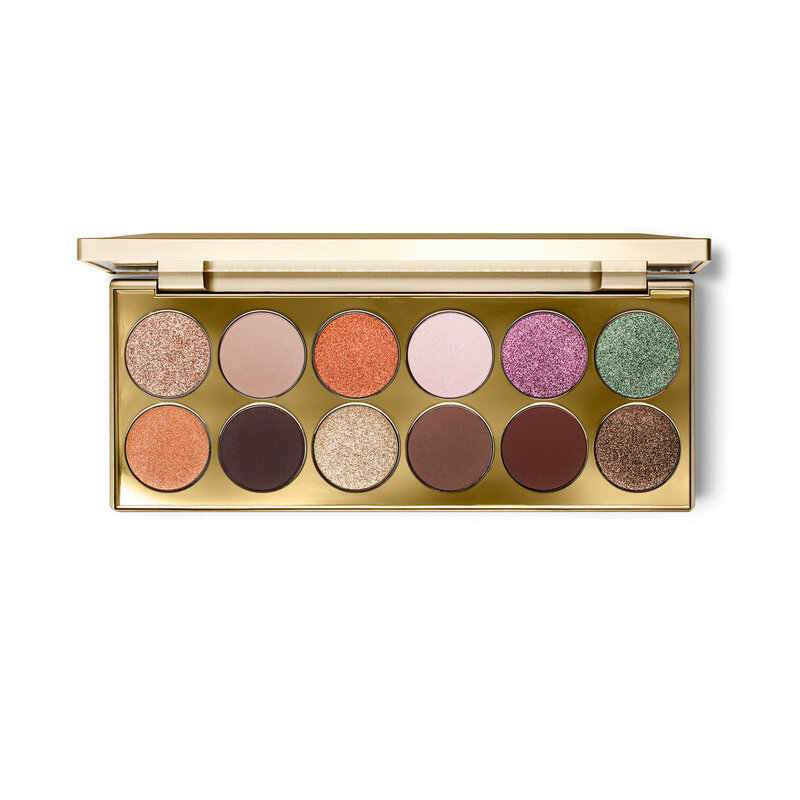 Rich, pigmented color combinations complement every eye color and suit any mood. Each incorporates glitter shades from the Fall 2018 Vivid & Vibrant Eye Shadow Duos with complementary neutral and high-impact shades. Each with twelve velvety-soft matte, shimmer, and cosmic glitter finish shadows and endless ways to use them. Micronized and silicone-treated pigments for superior blending and uniform color. Soft, creamy texture with no gritty after-feel. Weighted compact with jewel-like beveled edges elevates the experience. I have both of these palettes, and the only thing keeping me from sending them back are the shimmers, luckily the happy hour only has a few mattes. The shimmers in both palettes are absolutely beautiful and apply and stay on well, but the mattes are a sad disappointment, there is not a lot of pigment, but you can build them up, however once you build them up, they go patchy in places leaving skin showing thru, while the rest of it just blends away to nothing. It got so bad with the bald spots that I couldn't even take another eyeshadow over it, at last I had to wipe everything off and start again, bringing in my Jeffree Star palettes and using his mattes instead, then used the shimmers from the Stila palettes. Like I said, the shimmers are so gorgeous I have to keep them for those, otherwise I would return both.